I can hear a ticking/click noise in my engine room? Is that normal? This is completely normal, this faint ticking or clicking sound is the lower end of the Ultrasonic Transducers frequency sweeps. This is a good thing! There is some Fouling Growth starting to attach to my Hull, is my System working? Has the Ultrasonic Transducer come loose from its mounting ring? If so Tighten this to the hull. Is the transducer screwed in “flat” with the transducer mounting ring, and not on an angle? This would indicate a cross threading of the Transducer and its mounting ring, If so simply unscrew the transducer and attempt to re-screw it into the mounting ring without cross threading the transducer, if this is not possible Contact CleanABoat.com and we can provide a replacement mounting ring. Is your vessel Foam cored or Balsa Cored? We would suggest double checking with your manufacturer to ensure your vessels hull construction is not foam or balsa cored, if it is and you have not removed the core and mounted the transducer to the outer layer, please follow the instructions to do so and remount your transducer correctly. Contact us if you are unsure on how to do this. Is the Transducer mounted away from strengthening beams and supports and slightly off centre ? 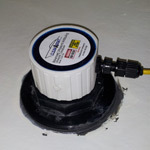 If not perhaps try re-mounting the Transducer in a different position on the hull away from solid strengthening beams and supports, follow the guidelines to mounting positions on CleanABoat.com. Do you have a reliable power supply? In some low power situations the Transducer Control Module will shut off when excessively low power is met. Ensure your Batteries maintain full charge at all time or employ our Dual Power system if applicable. Was the Hull prepared correctly for Transducer mounting? IE a smooth flat finish with either fiberglass Laminate or Bare metal exposed to the Transducer face? Check to ensure this is the case and rectify if not. Is there excessive Bonding agent either in the thread of the Transducer ring or stopping the transducer from screwing right down to the hull? Unscrew the transducer to inspect and clean away anything preventing the Transducer from mounting flush with the hull. How do I check to ensure my system is working? Our MK3 Ultrasonic unit is fitted with an informative LCD that provides realtime status. If there is an error it will be displayed on the LCD. It is a good idea to check and ensure your transducers are tightly connected to your hull regularly.